In the event of serious illness, Californians strongly indicate that they would want to have care that adequately addresses pain and discomfort as well as providing spiritual, social and cultural support - all of which are hallmarks of palliative care. Unfortunately, most patients at the end of life do not receive these services or only receive them much later in the course of care than is considered optimal. Among the factors affecting access to palliative care is health insureer reimbursement. Most benefits for these services are patterened on the Medicare Hospice Benefit (MHB), which is limited to patients with an expected prognosis of six months or less and prohibits reimbursement for curative care once patients choose palliative-focused care. 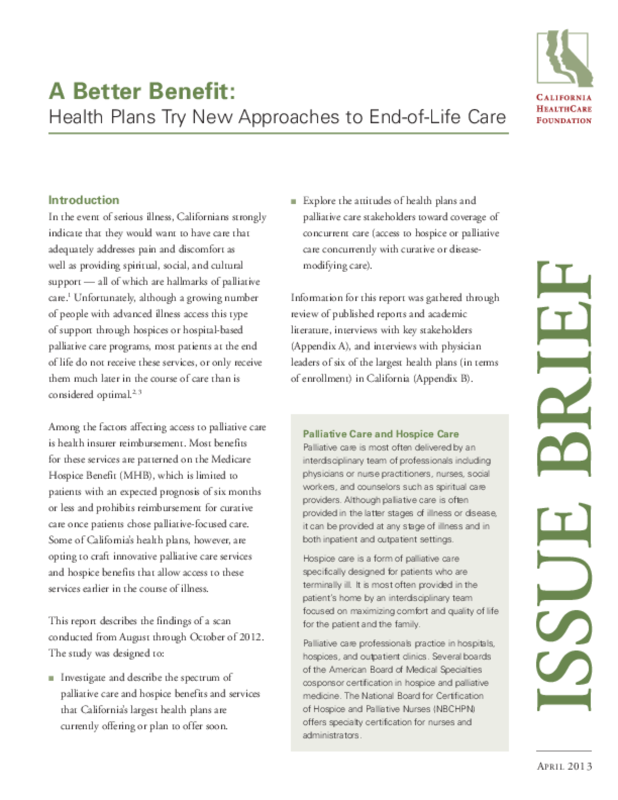 Investigate and describe the spectrum of palliative care and hospice benefits and services that California's largest health plans are currently offering or plan to offer soon. Explore the attitudes of health plans and palliative care stakeholders toward coverage of concurrent care (access to hospice or palliative care concurrently with curative or disease-modifying care). Information for this report was gathered through review of published reports and academic literature, interviews with key stakeholder, and interviews with physician leaders of six of the largest health plans (in terms of enrollment) in California.